1 Keep it simple. Planning is key to this. Itís so easy to jump in the car with the belief that itís fine to set the navigation system, have breakfast ìon the goî and make a few crucial calls ñ all en route. But even the most sophisticated in-car technology demands we divert attention from the pure task of driving. As the government increases penalties for drivers using their phones, and police promise to get busier spotting offenders, nowís surely time for all of us to ditch ideas of multi-task driving? For a peaceful, unflustered journey, research where youíre going before leaving, make any necessary calls beforehand, and confine your focus to the task in hand. 2 Be a karma driver. Itís a mad, bad world out there on UK roads ñ and the last thing they need is a driver who adds to the grim cocktail of hot-headed congestion. 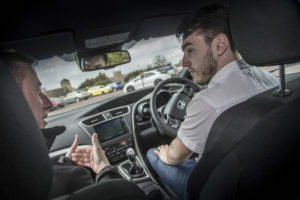 Before setting out, remind yourself every journey will feature other drivers whose sole mission may well seem to be annoying fellow road users. But donít take the bait: draw a deep breath and resolve to rise above the easy trap of believing itís your job to police the highway and act as a superhero arbiter. 3 Lighten up. The average British vehicle scuttles around with enough clutter on board to stock a car boot sale. As anyone old enough for a Saturday job in Halfords will tell you, items you donít need spell wasted fuel, but beyond the freakonomics of hoarding, possessions also apply an invisible handbrake to your driving soul. Knick-knacks that chink with every bump, toys that roll around under the driverís seat, discarded food packaging that wafts unsavoury fumesÖ spend an hour sprucing up your cabin and youíll notice a new serenity in your on-board ambiance. Uncleanliness is next to dogliness. 4 Sitting comfortably? The chances are youíre seriously not, even if you think your posture is a paradigm of man-machine harmony. Slumping in your seat, holding onto the wheel for dear life and misaligning your body with the position designers intended for optimal use can spell long-term aches and pains ñ and nobble your ability to drive to your best potential. Chiropractic sessions and explorations in osteopathy can drain your bank account as quickly as Esso; for a more economic approach to the science behind sitting comfortably, start with a self-help guide on the Alexander Technique. Itíll make a brilliant investment for your glovebox ñ and your body. 5 Improve. If youíve commenced action on these goals, you may be ready to take your driving to a new, more rarified level: that of an enlightened driver. Parking your wheels on such rarified ground depends, however, on one ironic factor: being ready to start again. Step one? Admit to yourself that youíre not a perfect driver; no one is. Step two: open your mind to the possibility of improving your skills. Step three: sign up for some level of skill improvement. This might be a refresher course with a driving instructor, or membership of the Institute of Advanced Motorists. If old dogs can learn new tricks, so can we. 6 Enjoy. Remember that first day when the L-plates were no more? The heady freedom of adventure to go where you pleased? Yep, itís a dim and distant memory clouded by the fog of modern life. But driving can, indeed, be a pleasure. And should be. A resolution we can all share? Drive for the journey, not the destination!